Windows 8.1 syncs your data between devices via SkyDrive. You can select what to sync, and if you disable it, you might want to delete data from Microsoft servers. SkyDrive is deeply integrated into Windows 8.1 and lets you store and sync data from your machine to the cloud. In fact, you no longer need to download the desktop version of SkyDrive, it’s already included. Also, if you sign in to your different devices with your Microsoft ID, all of your data is synced automatically with Microsoft servers. But you might want to periodically delete some of the data that’s sitting on Microsoft servers. Here’s how to delete the 8.1 settings as well as device settings. 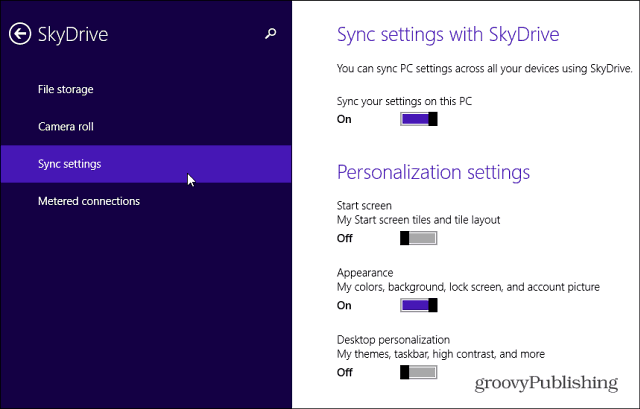 To check out where your SkyDrive sync settings are at in the new OS, go to Settings > Change PC Settings > SkyDrive > Sync Settings. Then you can scroll down and change what is or isn’t synced via SkyDrive to your other Windows 8.1 devices. Settings that can be synced include: Personalization, Apps and App Data, Web Browser favorites, history, and Settings, Back Up settings and more. Syncing is a great new feature in out opinion as you just sign in with your Microsoft ID and everything is there for you. But if you go through and switch the syncing switch off in the screenshot above, everything before that is still in the Microsoft data cloud. If you want to get rid of that data you can. 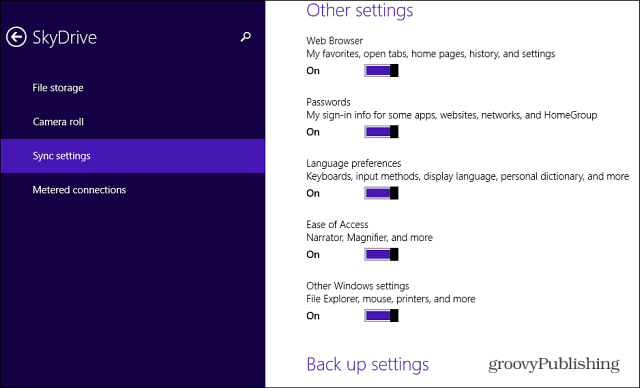 Just go to this Windows 8 Personal Settings Privacy page…You’ll need to sign in if you’re not already. You’ll see information from Microsoft on how to turn off syncing on each Windows 8.1 PC – the same thing described above. Then click the Remove button at the bottom of the page. Then verify you want to remove the settings from the cloud. 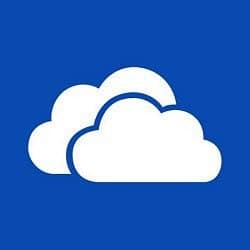 Note: Your personal settings might not be deleted from the cloud immediately; some info might remain on Microsoft’s cloud servers until the next scheduled clean-up process. One more step is needed to delete backed up device settings though. 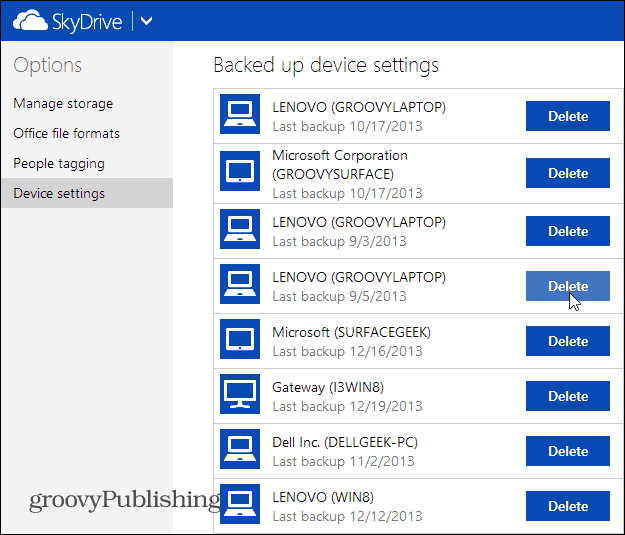 Heave to the SkyDrive Device Settings page, then delete the devices you want gone. To get there, open SkyDrive in your browser and go to Options > Device Settings. For instance here I have some devices listed more than once, some are VMs or systems I no longer have. This is also a good time to clean up my account. 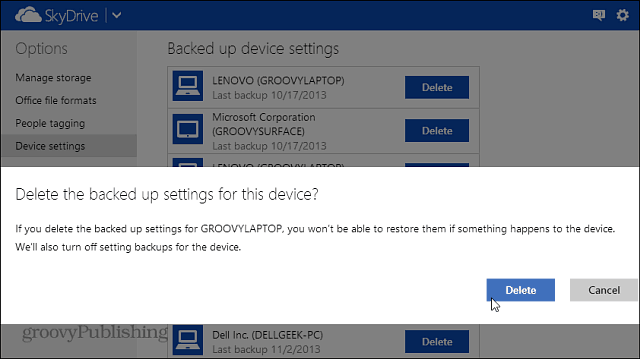 Note that when you delete backed up settings for a device, it also turns off setting backups for it.